Brazilian music comes in as many flavors as the tropical fruit sherbets we mention in the recipes section of our Web site. Don't feel intimidated by the Portuguese words and names you will encounter. Read on and enjoy! Visit our Music & Folklore Page to learn more about the extraordinary diversity of Brazil's music. The Roots of Brazilian Music - Part I - The three major contributions to Brazilian culture: Indian, Portuguese and African. The Portuguese first arrived in Brazil on April 22, 1500. (This occasion, like so many others in Brazilian history, has been duly commemorated in a carnaval song.) We know quite a lot about what they found, in musical terms, thanks to two extraordinary accounts of the music of Brazilian aboriginals dating from the 16th century. The French Calvinist pastor and writer Jean de Léry published in 1578 a book called Viagem à Terra do Brasil (Journey to the Land of Brazil), in which there were included illustrations, detailed descriptions of dances and rituals, and transcriptions of some musical refrains of the Tupis. Gabriel Soares de Sousa, a Portuguese colonist and chronicler, described in his 1587 treatise called Tratado Descritivo do Brasil the songs, dances and musical instruments of several tribes. He says that the Tamoios "are great musicians and dancers, and composers of improvised songs" and that the Tupinambás "carry in their right hand a maracá, a gourd filled with pebbles." 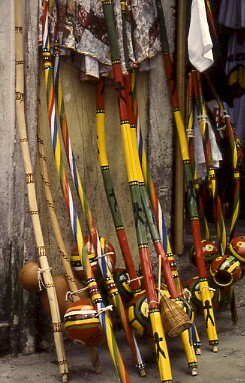 Brazilian Indian instruments still consist basically of those of percussion: rattles, drums, etc. and wind: flutes, whistles, and horns. According to Marlui Miranda, foremost authority on Brazilian Indian music, there's no Indian influence in Brazilian popular music, even if their contribution to the language, diet and character of Brazilians has been extraordinary. Over the centuries, simple folk, Jesuits and noblemen brought with them traditional dances and dramatic dances like the Bumba-meu-boi, lullabies and nursery rhymes, poetical and lyrical forms, and almost all of the basic musical instruments we hear in Brazil today: flute, clarinet, cavaquinho, guitar, piano, violin, cello, accordion, and the tambourine. 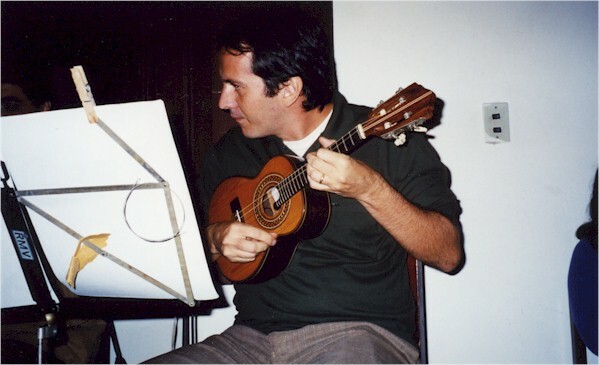 The cavaquinho, a small guitar with four strings, was also taken to Hawai where it became the ukulele. The first pianos arrived in Brazil in 1808, in the ships that transported the entire Portuguese court to Bahia and Rio de Janeiro following the invasion of their country by Napoleon Bonaparte. One word about the Portuguese language as it is spoken in Brazil. Very often one hears people say that "it is very musical." It sounds very different from continental Portuguese. It has nothing of the "skip all the vowels" or as someone said "surfing from consonant to consonant" quality of the language of the colonists. It has been softened and made mellifluous by the African influence. African slaves, who began arriving in Brazil around 1538, contributed decisively to the development of both rhythm and choreography (in dramatic dances and dances like maracatu, bumba-meu-boi, lundu, cateretê, cacuriá, jongo and most famous of all, the samba). 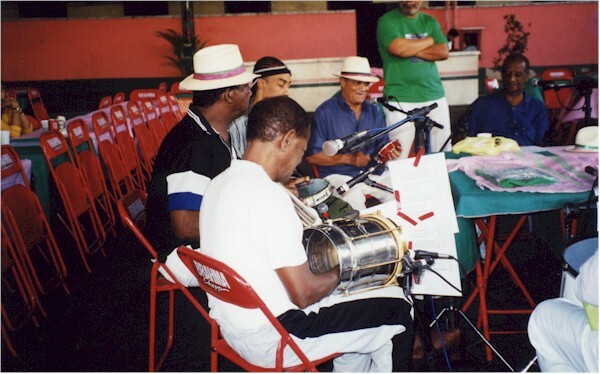 An extensive array of percussion instruments is of African origin: all kinds of drums, from the atabaques used in Afro-Brazilian religions to the surdo and tamborim of the samba school bateria (percussion section); the agogô, two metal bells played with a metal stick, and the cuíca. This unusual instrument is a small metal barrel covered with leather in one end, having attached inside to its center a short stick, which is rubbed with a piece of wet cloth to produce the most extraordinary sounds (sometimes you may think you hear laughter...). Anyone familiar with Brazilian percussion will immediately also think of the berimbau de corpo, a bow stretched by a wire, with an open gourd attached to one end resting against the abdominal cavity for resonance. The percussionist plays it with a stick while holding a type of rattle in his hand. It is the main instrument used in the capoeira, an exciting and beautiful Brazilian martial art of folkloric origin, which is one of the greatest attractions for tourists visiting Salvador in Bahia. These dances and instruments were extensively depicted in engravings and watercolors by European visitors during the 19th century. In a book published in 1835 by the German artist Rugendas, we see the lundu (a sensual forerunner of the samba) being danced by slaves and the white middle class alike. The process of acculturation lasted about three centuries, and Brazilian music until the middle of the 18th century remained folkloric or anonymous, none of it coming down to us. With the lundus and modinhas (sentimental songs) composed by Domingos Caldas Barbosa (1739-1800) we have the first documented popular music of Brazil. This page continues on Music Roots 2: Choro - A Brazilian Classic!